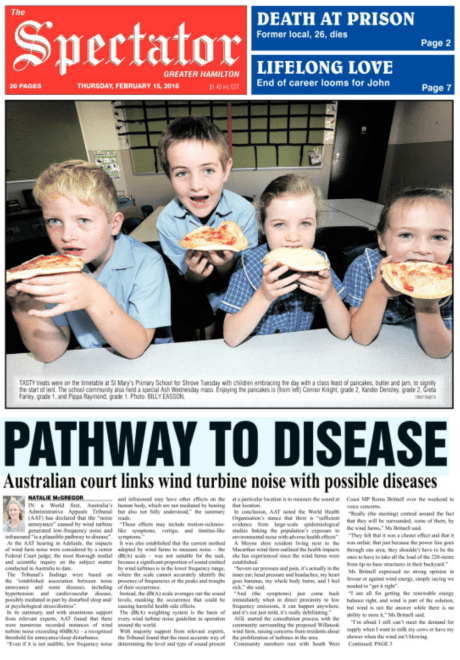 In a World first, Australia’s Administrative Appeals Tribunal (AAT) has declared that the “noise annoyance” caused by wind turbine generated low-frequency noise and infrasound “is a plausible pathway to disease”. At the AAT hearing in Adelaide, the impacts of wind farm noise were considered by a senior Federal Court judge; the most thorough medial and scientific inquiry on the subject matter conducted in Australia to date. The Tribunal’s findings were based on the “established association between noise annoyance and some diseases, including hypertension and cardiovascular disease, possibly mediated in part by disturbed sleep and/or psychological stress/distress”. In its summary, and with unanimous support from relevant experts, AAT found that there were numerous recorded instances of wind turbine noise exceeding 40 dB(A) — a recognised threshold for annoyance/sleep disturbance. “Even if it is not audible, low-frequency noise and infrasound may have other effects on the human body, which are not mediated by hearing but also not fully understood,” the summary reads. It was also established that the current method adopted by windfarms to measure noise — the dB(A) scale was not suitable for the task, because a significant proportion of sound emitted by wind turbines is in the lower frequency range, where the scale cannot accurately identify the presence of frequencies or the peaks and troughs of their occurrence. Instead, the dB(A) scale averages out the sound levels, masking the occurrence that could be causing harmful health side-effects. The dB(A) weighting system is the basis of every wind turbine noise guideline in operation throughout the world. With majority support from relevant experts, the Tribunal found that the most accurate way of determining the level and type of sound present at a particular location is to measure the sound at that location. In conclusion, AAT noted the World Health Organisation stance that there is “sufficient evidence from large-scale epidemiological studies linking the populations exposure to environmental noise with adverse health effects”. A Moyne shire resident living next to the MacArthur windfarm outlined the health impacts she has experienced since the wind farms were established. “Severe ear pressure and pain, it’s actually in the inner ear; head pressure and headaches; my heart goes bananas, my whole body burns, and I feel sick,” she said. AGL started the consultation process with the community surrounding the proposed Willatook windfarm, raising concerns from residents about the proliferation of turbines in the area. Community members met with South West Coast MP Roma Britnell over the weekend to voice concerns. “Really (the meeting) centred around the fact that they will be surrounded, some of them, by the wind farms,” Ms Britnell said. Ms Britnell expressed no strong opinion in favour or against wind energy, simply saying we need to “get it right”. “I am all for getting the renewable energy balance right, and wind is part of the solution, but wind is not the answer where there is no ability to store it,” Ms Britnell said. “I’m afraid I still can’t meet the demand for supply when I want to milk my cows or have my shower when the wind isn’t blowing. Tony Edney, director of the water foundation — an advocacy group for properly conducted, multidisciplinary research into health problems reported by people living in the vicinity of wind turbines and other industrial uses — told the Spectator that not every windfarm would necessarily generate problems. “The location, topography, layout and design of the installation of factors that combine with climactic conditions to produce sound generating profiles of potential harm for some receiver sites,” Mr Edney said. Mr Edney said it was “simply no longer possible” for the industry to say that its technology was “clean, green and completely harmless”. “Country people deserve to know what exactly they are dealing with when talk starts up about our windfarm proposed for their district,” Mr Edney said. Any politician who does not understand the danger for residents and is not promising to have these turbines turned off in order to protect people whose homes have been surrounded by turbines is not worth voting for in this election. Send each of the candidates all of the information on harm now. 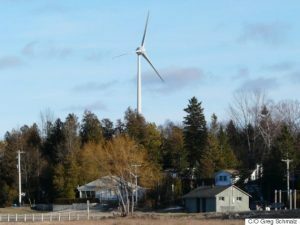 Ask them to speak publicly about this specific aspect of the industrial scale wind reality in rural Ontario communities. Carmen Krogh has done excellent work collecting information directly in face-to-face meetings with people whose lives have been so negatively impacted by turbines that they had to leave their homes in order to protect themselves or members of their family. Is her work available in audio or video format so that everyone can see for themselves how much distress residents of rural Ontario have endured when industrial scale wind companies have been allowed to trespass onto their property with noise, low frequency noise modulations and infrasound radiation? Carmen Krogh gave a presentation at your annual meeting on Saturday. Something about “abandoned properties”? Would you please post her slides? Also, do you have a list of speakers that day? I and many others would like to hear who attended and what they said. As I’ve said earlier, this is of the utmost importance as people are currently suffering under wind turbines and we need to find a way to stop them as soon as possible. Ms Krogh’s report was preliminary to analysis of the data from the research project and as such, is not ready for publication, at her request. The tides are changing for corporations that are harming people. One day soon, the onus of proof that harm is occurring will be lifted from the shoulders of victims of industrial wind turbines and placed squarely on the wind companies and governments that allowed this to happen.